“It is clear that 2009 is going to be very challenging for us all and it is very important that the Government continues to act positively to help people through these difficult times. That is why I am backing the exceptional measures that Gordon Brown is taking. The mistakes of the 1980s and early 1990s must not be repeated. “As an Usdaw official helping our members working in shops, I fear that the retail sector is going to take a big hit in the new year. That is why I am campaigning for the completion of the redevelopment of Crewe town centre and bus station. If local traders are to stand any chance they need an environment that welcomes shoppers to the Town, unfortunately we don’t have that at the moment. Retailers and shopworkers must not be let down on this important issue. The team took my mobile surgery around Wistaston and Nantwich today and we had some good discussions with local residents. The future of British manufacturing was raised by a few people. There are clearly difficult times ahead and two of our major engineering employers are currently experiencing difficulties. Bentley's are on an extended Christmas break and short-time working. Bombardier is shedding some jobs. However both are showing a commitment to the future, with Bentley's investing in up-skilling the workforce and Bombardier taking on apprentices. Let's hope these signs of better things to come. We arrived in Nantwich to find homemade signs attached to lampposts, advertising a tattoo service for £1 per go. Some young entrepreneurs had set a stall outside their house. However, by the time we turned up, a lady informed that they'd gone to play upstairs because it was too cold outside. Perhaps they'll give it another go in the summer. Who knows, we might be seeing them on Dragon’s Den in the future. 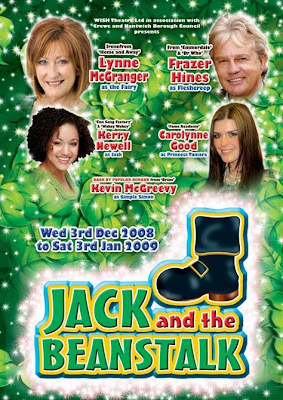 We have just come back from our annual trip to the Pantomime at the Lyceum Theatre in Crewe. I have to say that this year's production was excellent. We were all very impressed with the SiSiTV. I won't give it away for those who haven't been yet, but I wish I'd been in Wilkinson’s on the day they filmed that part of the show, looked like great fun. There were three generations of our family there and everyone thoroughly enjoyed an excellent evening’s entertainment. The Lyceum Theatre is a facility we should all be very proud of and it is very deserving of our support. But it also needs political support and I hope that the new Cheshire East unitary authority commits to the theatre in the same way that Crewe and Nantwich Borough Council has over many years. To see what's on at the Lyceum please click here. The team were out doing a double session of mobile surgery today in Maw Green and Marshfield Bank today. 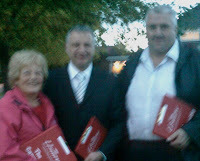 We were also collecting signatures on the petition for a town council for Crewe, giving local residents a strong voice. - Pub closures, I too am worried about the number of pubs closing. This afternoon's session met at The George, which is currently closed. This morning we met at the Cross Keys, which thankfully has just reopened. I think the Government has to do more to support local pubs, they are a very important part of our community. - Job losses, one guy I spoke to had recently been made redundant and we had a long chat about the support the Government has implemented to help him get back to work as soon as possible. For information on how Job Centre Plus can help please click here. The family went out leafleting today ahead of tomorrow's mobile surgeries. We all felt we had plenty of turkey to walk-off. What a beautiful day, bright, sunny but nippy. My son was showing-off his amateur photography skills with his new digital camera. "My thoughts are with those who have to work on Christmas Day and, particularly our emergency service workers, my thanks go out to them. "Many families face an uncertain future with the current economic crisis. I have been working with Usdaw members in struggling retail companies, like Woolworths and MFI, to deal with the problems of redundancy. The true test of politicians is dealing with difficult circumstances and I am working with our Government to help protect jobs and homes for UK workers. David Williams, Labour's Prospective Parliamentary Candidate for Crewe and Nantwich, has welcomed a new cash boost for 24,250 people living in Crewe and Nantwich as part of the Labour Government's financial help. Following the coldest start to winter in thirty years, the Government this week formally ordered a special one-off payment of £60 to pensioners, carers, disabled people and those in receipt of bereavement benefits. David Williams said, "I'm pleased that the Government has helped the most vulnerable and its right that they've invested this extra cash. 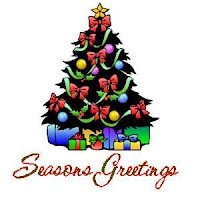 The Christmas bonus will be a real winter warmer for all who get it." This help is in addition to the extra £4bn which will be spent on pensioners next year, announced by the Chancellor in the pre-budget report. This means the biggest increase in the State Pension since 2001, bringing it from £90 to £95 a week, and the biggest increase in Pension Credit since it was introduced, so that no pensioner need live on less than £130 a week from April 2009. David Williams added, "The Tories say we should do nothing to help people in Crewe and Nantwich. Thankfully the Government has ignored the Tories and is putting an extra £60 in every pensioners’ pockets, alongside their increased Winter Fuel Payments. “This is real help going to 19,460 pensioners and 450 kids and 4,240 working age people, all living in Crewe and Nantwich. The Christmas Bonus will be paid in two instalments - recipients will get £10 in December, as in previous years, with the additional £60 to be paid between January and March in the New Year. The majority of State Pensioners should receive the £60 payment in January 2009 in addition to their pension. The remaining three million people will get their £60 in February or March 2009. The Labour government is spending £575m on increased Winter Fuel Payments this year, with someone aged between 60 and 79 will receiving £250, and £400 for households with someone 80 and over. The Tories never made Winter Fuel Payments. Labour has made it easier and quicker for those eligible for Pensions Credit to get the help they are entitled to, without the need to fill in any forms. They can also be assessed for Council Tax Benefit and Housing Benefit at the same time. Cold Weather Payments have also been increased from £8.50 to £25 per week for winter 2008/09. They are paid out when the average temperature where the recipient lives is recorded as, or forecast to be, zero degrees Celsius or below over seven consecutive days during the period from 1 November to 31 March. Please click here for more information on cold weather payements. The future of the pint of beer and the mile have been secured, after the Government's victory in removing European legislation that would have required the UK to sell beer in litres and measure road traffic distances in kilometres. Legislation agreed by the European Parliament will allow the UK to continue its use of the mile for roads, the pint for draught beer, cider and bottled milk, and the troy ounce for precious metals. The opt out has been granted indefinitely. The Government has also secured the future use of imperial units for all other uses, provided they are used alongside metric equivalents - in the form of dual labelling. David Williams, Labour's Prospective Parliamentary Candidate for Crewe and Nantwich, said, "We like our pint and our mile. We should be able to use the measures we are most familiar with, and now we can be sure that we will continue to do so. "The Government made strong arguments for the UK's right to carry on using pints and miles and maintaining dual metric and imperial labelling. I know how important this is to the British people and businesses and we are grateful for the Commission's support". 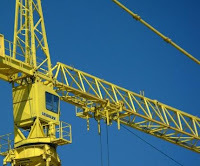 The European Parliament has agreed a proposal to update the Directive on Units of Measurement (Directive 80/181/EC) to remove the 2009 deadline for the end of supplementary indications (i.e. the use of imperial alongside metric) and to allow the UK to decide the future use of the mile for road traffic, the pint for draught beer and cider and bottled milk and the troy ounce for precious metals. The European Council agreed this text on 18th November. The new Directive is expected to be formally signed early next year. The UK took the decision in 1965 to adopt the metric system in stages, in response to the adoption of metric as the international system of measurement worldwide. The country is now substantially metric - the vast majority of goods are subject to the Weights and Measures Act 1985 so must be sold in metric - the only exceptions are doorstep milk, draught beer/cider and precious metals. Dual labelling in both metric and imperial is permitted, in recognition that there remain a number of people in the UK who are more familiar with or prefer to use the imperial system of measurement. I read with some disappointment the comments of Cllr Arthur Moran (Letters, 26/11/08), who chose to misrepresent the views I expressed in my letter to the Chronicle the week before. What I actually said was that Mr Timpson, "has failed to speak [in Parliament] on important issues from the constituency like...Nantwich’s First Responders Service". I stand by that comment. If Arthur can quote a speech made by Mr Timpson in Parliament on this issue, then I will gladly withdraw my remarks. The point of my letter was to say that Mr Timpson’s unique and privileged position allows him to use Parliament to run campaigns and question the Government on any issue he chooses. But he also has the responsibility of representing the views and concerns of constituents. In the case of Nantwich First Responders he has not done that. Anyone can present a petition to No. 10 and attend a protest march, but only one person can stand up for Crewe and Nantwich by speaking in Parliament and that one person is our MP. Unfortunately we don't appear to have a MP who is either willing or able to do that on the issues that matter most to local people. If I had the honour of being the Member of Parliament for Crewe and Nantwich, you can rest assured that I would be a full-time MP who stood up and spoke out in Parliament on behalf of local people. "I am delighted that the Borough Council has listened to my campaign and finally recognised Labour's tax break for motorists, which was announced by the Chancellor two weeks ago. If the Council passes on the VAT reduction in parking charges that will help local drivers and traders as intended by Alastair Darling. "However I would like to see the detail of what the Council proposes and I am very concerned that further assistance before Christmas has been dismissed. Have the traders in Crewe and Nantwich been asked what they need? Bearing mind that many retailers make a substantial part of their profits in the month of December, wouldn't more free parking before Christmas be the best solution for local businesses?" “We want the full 2.5% VAT saving passed on to motorists”, says David Williams, Labour’s Prospective Parliamentary Candidate for Crewe and Nantwich. Tory Council Leader, John Hammond, this week announced limited free parking, claiming it would cost the Crewe and Nantwich Borough Council £17,000 in lost income. David Williams said, “The Borough Council have been given over £34,000 VAT relief in car parking charges by the Chancellor of the Exchequer. Last week’s announcement means that the Council is pocketing over half that money. They are not passing the full benefit on to motorists and they have given no commitment to do so. 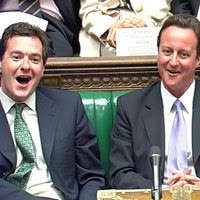 “Labour made the cut in VAT to give a stimulus to the economy during the current global downturn. In the same way that we expect retailers to pass on the tax cut and banks to pass on the interest rate cut, we also expect local authorities to their bit. “Crewe and Nantwich traders have been let down by the Tory controlled council. The council could make a real difference by providing much more free parking in both towns, attracting shoppers from around the area and helping retailers in what could be a difficult Christmas. “Local businesses, particularly those in Crewe must be pulling their hair out with this Tory run Council. First we had their dithering on the Crewe town centre redevelopment, which has lead to the project being shelved with no firm start date in sight. Then we have seen three increases in parking charges in 18 months, when Labour used to only apply increases every two years. Finally they are pocketing money from Government aimed at helping traders through these difficult times. 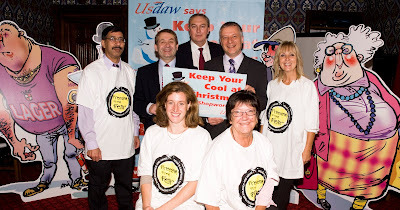 As the holiday season approaches, David Williams, Labour PPC, is urging people in Crewe and Nantwich to ensure that they leave their cars at home if they plan to drink this Christmas. In Crewe and Nantwich people are killed and seriously injured every year because of drink driving and 60 died on North West roads in 2006. That’s why David Williams is backing the Government’s THINK! Campaign, which is raising awareness of the devastating consequences of drink driving. Hard-hitting adverts will be running throughout the festive period to help get this message home: TV advertising: 1st - 31st December 2008; Cinema advertising: w/c 12th & w/c 26th Dec 2008; Radio advertising: 1st - 31st December 2008; Ambient advertising (in-pub): 8th Dec - 13th Jan.
David Williams, Labour's PPC for Crewe and Nantwich, addressed Usdaw's North West Conference today. Also on the platform was Steve Carter (pictured). Steve is number four on Labour's list of Euro candidates and spoke to delegates about the importance of maximising Labour representation in next June's European elections. Many rights for working people come from Europe and we are dependent on our European trading partners for jobs. 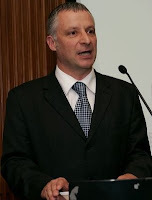 Steve also warned of the threat from the BNP, particularly in the North West. Only complacency will let the fascists win. 1. National Minimum Wage frozen. If you earn on or close to £5.73 per hour then the next election is about whether you want a pay rise or not. With Labour you get a rise, with the Tories you don't. 2. Tax credits abolished. The Tories will take money aimed at helping work pay from hard working families and low-paid workers. Their tax priorities are to give the families of every multi-millionaire a massive inheritance tax break. 3. Deregulation of shop trading hours. The Tories will attack the family friendly Sunday trading hours, a compromise agreed in 1994 that helps millions of shopworkers balance their home and family life and allows retailers to trade. 4. Attack trade unions' ability to represent workers. The Tories will try to finish the job they started in the 1980s and stop trade unions from standing up for hard working people. 5. Opt out of the social chapter. The Tories are still committed to reversing Labour's basic employment rights. These rights create a level playing and stop rogue employers undercutting good employers. The Tories will end the right to paid holidays, proper breaks at work, equal treatment of part-time, fixed term and agency worker and much more. We cannot afford for the Tories to drive Britain into a low pay and low skill economy again, as they did in the 1980s. Families in Crewe and Nantwich received a big boost today with the news that the right to request flexible working will be extended. The right to request flexible working will be extended to working parents who have children up to the age of 16 helping many families balance their work and family life much more easily. The current right only applies to parents of children aged up to 6. “Extending the right to request to the parents of older children will give a big boost to busy parents in Crewe and Nantwich who need more help balancing work and family life. “Whether its managing the school run or being able to work from home these new rights will make life much easier for many parents. "I am particulalrly pleased that this right has been extended because it is something I have been campaigning for with my union Usdaw. Flexible working has proved to be extremely successful. It has allowed many parents to access work, where traditional hours would have made it impossible. This in turn has helped employers recruit and retain experienced staff. "I urge all employers to look favourably on requests for a change in working hours to help people stay in work." Today’s announcement builds on the right to request flexible working given to parents of children up to the age of six and the parents of disabled children. Despite their warm words now, David Cameron and the Tories actually opposed flexible working. Around six million employees currently have the right to request flexible working but over 14 million employees, including part-time workers, actually work flexibly. Flexible working arrangements include working from home, part-time work, compressed hours, flexi-time or other arrangements agreed with employers. On World AIDS Day on December 1st, David Williams has welcomed the UK’s global leadership on the global fight against HIV and AIDS. David Williams said, “I know that many people in Crewe and Nantwich are concerned about action on the global scourge of HIV and AIDS. They want the UK Government to maintain its global leadership on this issue and meet its commitments to the world’s poorest people. With 33 million people still living with HIV and AIDS worldwide, we must continue to act." - In most of sub-Saharan Africa, national HIV prevalence has either stabilised or is showing signs of decline. - Since 2004, 20 times more people have access to life-saving treatment and the price of first line AIDS drugs has fallen consistently. David Williams concluded, "I am proud that the UK Government remains so committed to tackling poverty at home and abroad." The National Minimum Wage is even more important to families in a global economic downturn..
Everyone should earn a fair wage for a fair day's work - there is no excuse not to pay up. And there were two welcome bits of news this week that will be a boost to workers in Crewe and Nantwich. The Government has said that it wants to change the current minimum wage rules on tipping so that in the future, tips will be in addition to the Minimum Wage. For me, this is a matter of fairness and common sense. When you go to a restaurant or to have a hair cut and leave a tip, you expect it to go to the staff on top of their pay, not to be put through the payroll to make up the Minimum Wage. This action on tips will benefit workers throughout Crewe and Nantwich, people we all rely on, but who sometimes don’t have the strongest voice. And as part of Labours crackdown on those who try to exploit workers, tough new penalties for employers who underpay their staff have been made law. I have campaigned for tougher action on rogue employers who con their staff. It has now become law. This will mean that the tough new penalties come into force in April. There could be unlimited fines for the most serious cases rather than the current maximum limit of £5,000. It will also mean a fairer way of dealing with national minimum wage arrears, calculated so workers do not lose out. But to make sure people are getting the National Minimum Wage rogue employers need to be exposed. If you think a rogue employer is not paying up then get in touch with me on 07798 696 603 or call the national minimum wage helpline on 0845 6000 678. And don't worry, you don’t have to give your name or details to them if you don't want to. This year marks 10 years since Labour voted to introduce the National Minimum Wage in 1998. When it came in ten years ago people like David Cameron strongly opposed it. I'm proud that, while the Tories opposed the minimum wage and still criticise it, our Labour Government is taking steps to strengthen it – ensuring that working people know their rights and employers know their responsibilities. I had a call from a nice gentleman from Mr Timpson's Office today. He had been very busy reading through my blog entries for at least the last three months and queried my story on the painting of Crewe bus station, which I published on 26 August. This nice gentleman explained that my article had implied that Mr Timpson had said something that he hadn't. I have therefore changed the wording to reflect that my source is an article published on Mr Timpson's website, not something he has actually said. There is of course something else that Mr Timpson hasn't actually said. He hasn't answered the question, what is our Tory-led borough council, our Tory-led unitary authority and our Tory MP actually doing about the disgraceful state of Crewe bus station? This sorry situation continues to be an embarrassment to the town and it is time the Tories did something about it. Please click here to see the amended article. We took the campaign for a town council for Crewe to the Alex today. It proved to be very popular with the regulars in the Alexandra Suite, who were enjoying a pre-match drink. I was there supporting local activists Steve Roberts, Malcolm Scane, Peter Kent and Ray Stafford. The fans were really positive about the town council proposal, but somewhat apprehensive about the forthcoming Alex game against Leyton Orient. Having lost 2-0, with a pretty disappointing performance, the frustration of fans in the ground was all too evident. It's going to be a long hard season ahead of us. Local Post Offices received a boost today as the Labour Government awarded the contract for the POCA service to the Post Office. The news will be welcomed by local post offices who rely on the business people picking up their pensions or benefits through the Post Office Card Account brings into branches. Around 6,850 people in Crewe and Nantwich have accounts. The Labour Government has decided to award a new contract for the continuation of POCA directly to the Post Office. This announcement is good news for the Post Office as the card account is an important source of income and brings customers through the doors of post offices across the country. 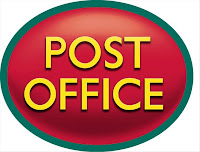 The National Federation of Sub Post Masters had said that, without POCA 3,000 Post Offices would close. For further information please do not hesitate to contact David Williams on 07798 696 603. The Post Office Card Account is a very straightforward account specifically designed to pay benefits administered by the Department for Work and Pensions, the Northern Ireland Social Security Agency, Service Personnel and Veterans Agency and Inland Revenue tax credits. Only benefits and pensions can be paid in and they are collected across a post office counter using a plastic card and PIN. About four million people receive their benefits and pensions this way, including around two million pensioners. The National Federation of Sub Postmasters had claimed that 3,000 post offices might close if post office did not receive the contract. Please click here to see the wide range of services offered by your local Post office. David Williams, Labour PPC for Crewe and Nantwich, has welcomed a funding boost announced by the Government today to start rebuilding local primary schools. Cheshire will receive £14.4m to kick start the Labour Government’s plan to rebuild or refurbish half of all primary schools over the next fifteen years. The funding plans - worth £3.55 billion across England – were confirmed this today by the Schools Secretary Ed Balls. "Children deserve the best facilities that we can build and teachers deserve better classrooms to work in. So this funding is a really welcome boost from the Labour government for education in our area. "Ten years ago classrooms were in a terrible state. That's been transformed by the biggest ever investment in new buildings, computers and other facilities including the “The Dunwoody” building at Wistaston Green Primary School and the new Coppenhall High School. But there is still more to do to get the very best facilities in all our schools and replace old buildings that are no longer fit for the job. “At this challenging time for our economy, it’s vital that we sustain our investment in public services. This huge capital investment will not only improve the education of our children, but help to support jobs in the construction industry and local businesses who will be crucial to fitting out the new and refurbished schools. Ninety years ago, on the eleventh hour of the eleventh day of the eleventh month, the guns of the western front fell silent. It was an end to four years of fighting, the most horrific conflict the world has ever seen. So at 11 o’clock this morning we stood in silence to remember all of the brave men and women of our Armed Forces who gave their lives for the freedoms we enjoy today. And we commemorated those who died in the Great War and in conflicts since — World War Two, Korea, Northern Ireland, the Falklands, the Gulf, the Balkans, and now in Iraq and Afghanistan. I went to the Remembrance Sunday service in Crewe's Municipal Square. First time I've been since the memorial was moved. I thought the service was very fitting and the venue really works, it makes you wonder what all the fuss was about. There was an excellent turnout from local people, it looked like they were eight deep all around the square. I thought the whole service was very well organised, congratulations to the Borough Council, the Royal British Legion and all involved. The family were attending services all over the North West. My son was marching with his Scout group in Eccles with mum looking on and my youngest daughter was in Sandbach with her granny. With British forces still on operations in Iraq and Afghanistan, it was an opportunity to show them our support as well as remember the millions who have died in past wars and conflicts. Back in 1918 people hoped the Great War would be the war to end all wars, but sadly that was not to be. Cheshire Constabulary, along with the other 42 forces, has signed up to a national policing pledge and are working towards delivering it. 1. Always treat you fairly with dignity and respect ensuring you have fair access to our services at a time that is reasonable and suitable for you. 2. Provide you with information so you know who your dedicated Neighbourhood Policing Team is, where they are based, how to contact them and how to work with them. 3. Ensure your Neighbourhood Policing Team and other police patrols are visible and on your patch at times when they will be most effective and when you tell us you most need them. We will ensure your team are not taken away from neighbourhood business more than is absolutely necessary. They will spend at least 80 percent of their time visibly working in your neighbourhood, tackling your priorities. Staff turnover will be minimised. 4. Respond to every message directed to your Neighbourhood Policing Team within 24 hours and, where necessary, provide a more detailed response as soon as we can. 5. Aim to answer 999 calls within 10 seconds, deploying to emergencies immediately giving an estimated time of arrival, getting to you safely, and as quickly as possible. In urban areas, we will aim to get to you within 15 minutes and in rural areas within 20 minutes. - If you are vulnerable or upset aim to be with you within 60 minutes. - If you are calling about an issue that we have agreed with your community will be a neighbourhood priority (listed below) and attendance is required, we will aim to be with you within 60 minutes. - Alternatively, if appropriate, we will make an appointment to see you at a time that fits in with your life and within 48 hours. - If agreed that attendance is not necessary we will give you advice, answer your questions and / or put you in touch with someone who can help. 7. Arrange regular public meetings to agree your priorities, at least once a month, giving you a chance to meet your local team with other members of your community. These will include opportunities such as surgeries, street briefings and mobile police station visits which will be arranged to meet local needs and requirements. 8. Provide monthly updates on progress, and on local crime and policing issues. This will include the provision of crime maps, information on specific crimes and what happened to those brought to justice, details of what action we and our partners are taking to make your neighbourhood safer and information on how your force is performing. 9. If you have been a victim of crime agree with you how often you would like to be kept informed of progress in your case and for how long. You have the right to be kept informed at least every month if you wish and for as long as is reasonable. 10. Acknowledge any dissatisfaction with the service you have received within 24 hours of reporting it to us. To help us fully resolve the matter, discuss with you how it will be handled, give you an opportunity to talk in person to someone about your concerns and agree with you what will be done about them and how quickly. We want to do our best for you but if we fail to meet our pledge we will always explain why it has not been possible on that occasion to deliver the high standards to which we aspire and you deserve. Click here to check out your local policing team. This afternoon I did my first door knocking session as the PPC for Labour in Crewe and Nantwich. I was really pleased with the reception I received. People raised a few different issues on the doorstep. I met a couple of sorting office workers who were at the rally last Saturday. We had a good chat about the future and agreed that it is important the industrial action ballot goes through to try to bring Royal Mail management to the negotiating table. The company must give the CWU the opportunity to look at the national plan for sorting offices, rather than picking them off one-by-one. We were collecting signatures on the petition for a Crewe Town Council again. There was a lot of support for the proposal, people recognise the need for a strong voice for the town. One woman told me she'd written to Edward Timpson and not received a response, so I was happy to take up the issue on her behalf. I am happy to support constituents' cases and help wherever I can. We finished at the Sydney Arms, a super little pub. It's what I call a proper pub and the Robinson's Unicorn Bitter was excellent. It's important that we use our community pubs to help keep them trading and open for business. I saw the article by Cllr Howard Curran in this week's Chronicle about the number of local pubs closing down and I share his concern. George Osborne has again shown today that the Tories do not have a coherent answer to the global financial turmoil. The Tories remain totally confused on borrowing: first calling for borrowing to fall, then for it to rise, now George Osborne says he wants a limit but cannot say what that limit would be. Only two weeks ago, Osborne pledged not to interfere in the Bank of England's independence in setting interest rates, now he's calling for a cut. And today, while Labour is reducing taxes by £120 for 22 million basic rate tax payers and freezing fuel duty, George Osborne is the one who is proposing an immediate 5p per litre increase in fuel duty - a damaging tax rise at a difficult time for families and small businesses. Because of his willingness to create headlines on the hoof, Osborne has called it wrong at every turn - opposing Labour's decisive action on Northern Rock, on Bradford and Bingley, on regulating the mortgage market. His speech today was a chance to correct some more of his mistakes - such as the £8 billion miscalculation in the Tory health policy - but Osborne has got it wrong again. "Increasing borrowing is not a strategy for dealing with the recession", Philip Hammond, BBC News, 27 October 2008. Then in the same interview he said, "To increase borrowing to deal with an economic downturn - that's a perfectly sensible thing to do." Charlie Stayt (interviewer): You'll know very well that what people love to hear from people in your position is specifics. 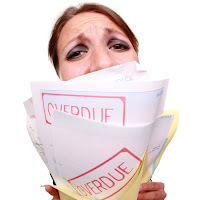 What would you actually do about a specific ... now help me with the fuel surcharge issue. Am I right in thinking that the Tories had a policy that you suggested when the price of petrol goes up you should reduce the levy on it and when it goes down as it has now, you would add to people's bills. Is that right now, if you were in power, would you be adding more to people's petrol bills? George Osborne: Well when the price of oil surged the government didn't help people and for months people have been struggling with those higher petrol prices at the pumps and we suggested, you know you need to work out the exact details of how the scheme operates and we would introduce it having consulted on it, you know, first Conservative budget. But what we've said is that when the oil price surges you shouldn't be making things worse by putting up the taxes on families. CS: ... put extra money on it so it costs people more? GO: Well of course you've got to remember what's happening now. The prices are coming down from the very high point where we would have been able to cut duty as it went up, so that's, you know, that's a very key point to bear in mind. CS: People would pay more money for their petrol if the Tories were in charge now? GO: As it happens, the sterling, the price in pound, for oil today is same as the forecast in the Budget when we talked about this policy. So what we're saying is governments should be there to help people by getting money into their pockets when the price of the goods they're buying like petrol is going up. We should be helping people now by freezing their council tax, we should be helping people who run a small business by cutting their payroll taxes and giving them a VAT holiday, so these are very specific tax measures and there is a big contrast in British politics because Gordon Brown or Alistair Darling when they sit on this sofa what they say is we need big spending splurges, more big government programmes in the hope it's going to trickle down to people at the bottom of the tree. I don't think it works. What people want is a gov ernment that's in control of the public finances and then is able to offer targeted tax help. I know the global banking problems are putting real pressure on some households in Crewe and Nantwich. The Government has recently announced a new £1 billion housing package offering new measures to help people struggling with their mortgages and support for first time buyers and new rules for banks to help people stay in their homes. I wanted to make sure local people knew about the help and advice that is available. - Your mortgage company should first be able to discuss options for changing the terms of your mortgage if you’ve got arrears. - If you still can’t meet your mortgage payments your local housing association can give you an equity loans or buy a share of your home to help cut your mortgage payments. - If you do find yourself facing repossession your local council or housing association may be able to buy your home and rent it back to you. - But the Government has also introduced new rules which mean courts expect lenders to work with you on alternatives and ensure judges are aware repossessions should be a last resort. - If you’re out of work or getting Pension Credit you can get support with paying your mortgage interest. - Also depending on how much money you have coming in, your age, health and the size of your family, you may also be eligible to claim Council Tax Benefit. This is a rebate or reduction on the current rate of Council Tax you pay. You can apply for Council Tax Benefit at any time by making sure that your local council is aware of your personal circumstances. - If you’re finding it hard to get on the property ladder you can get interest free loans worth 30% of the house price. - You can get a one-year Stamp Duty holiday for all houses costing under £175,000 meaning that 50% of all house purchases will be exempt. - Labour is also bringing forward £400 million of Government spending to deliver up to 5,500 new social rented homes, at good prices, over the next eighteen months. If you are worried your house may be repossessed you can contact your local Council or housing association about the support that is available. If you’re coming up to remortgage you can get help and advice on how to get the best deal. This is available through the FSA’s Moneymadeclear website. I welcome the invitation by Ken Veitch (Letters, 29 October) to elaborate on my opinion that Edward Timpson MP is not standing up for the people of Crewe and Nantwich. Mr Timpson’s unique and privileged position allows him to use Parliament to run campaigns and question the Government on any issue he chooses. But he also has the responsibility of representing the views and concerns of constituents. Yet in the six months he has been an MP, Mr Timpson has made few contributions in Parliament and has failed to speak on important issues from the constituency like job losses at Bentley and Focus DIY; the future of Crewe railway station; Nantwich’s First Responders Service, amongst others. Further, in the two weeks that I have been selected as Labour's Prospective Parliamentary Candidate I have already been approached by two constituents who wrote to the MP and didn’t get a response. Now we know that Mr Timpson is a very busy man. Not only is he our MP, but he continued to practise as a barrister after he was elected and he is a paid legal advisor for Timpson Limited. Perhaps his other jobs are getting in the way of him standing up in Parliament for the people of Crewe and Nantwich? Mr Veitch also asked for my views on a few issues. With regard to Iraq and Afghanistan, I fully support the tremendous work that our armed services are doing in very difficult circumstances. I hope that the forthcoming Remembrance Sunday will be an opportunity for us to send a message of support to the men and women who are serving in those two conflicts as well as remembering the millions of brave people who lost their lives in many wars and conflicts over the years. With regard to Trident, I have never been a supporter of unilateral nuclear disarmament, favouring the multilateral approach. To decide not to renew our nuclear defence system now would leave us, in the future, without a nuclear deterrent that is fit for purpose. That would be an act of unilateral disarmament, which I would oppose. I am always happy to give a straight answer to a straight question. Rest assured, if I have the honour of being elected the MP for Crewe and Nantwich I will be a full-time MP and give the job of standing up for the people of Crewe and Nantwich my undivided attention. "Good afternoon. This is an excellent turnout and we deserve much better weather than this! "I am here wearing two hats. First as the Political Officer for the Union of Shop, Distributive and Allied workers and I bring fraternal greetings from Usdaw. "Second as Labour's newly selected Prospective Parliamentary Candidate for Crewe and Nantwich. And I can assure you that you the sorting office staff and the CWU have the full support of Crewe and Nantwich Constituency Labour Party. "I believe that history will judge the Chief Executive of Royal Mail, Adam Crosier, in the same way as we currently regard Doctor Beeching. "Both took a narrow view of costs and efficiency and neither put any value on people and communities. "There is no doubt that the proposal to close the Crewe Sorting Office is bad for people, particularly the staff at Weston Road. And it is bad for the community, particularly the economy of Crewe and Nantwich. "For that reason I am supporting the CWU in whatever action they deem necessary to bring Royal Mail to the table and negotiate properly on a national plan for sorting offices. Because at the moment, they are picking off sorting office by sorting office, which is not an appropriate or fair way for the management to behave. "This week you may have heard talk about privatising parts of the Post Office, by a certain Cabinet Minister. Something that I have campaigned against with the CWU. "We were at Warwick and, as a joint trade union team, we secured the policy of a publicly owned Post Office for Labour's manifesto at the last election and the next. "It is Labour Party policy and remains Labour Party Policy. I can assure you that I will oppose any attempt to privatise the Post Office, whether it comes from my own Government or any other Party." A well attended meeting of Crewe and Nantwich Constituency Labour Party tonight heard from new Prospective Parliamentary Candidate David Williams about plans to win back the seat for Labour. If you want to be a part of the campaign to make a gain for labour at the next general election please click on the button above to join Labour. I know many people in crewe and Nantwich are worried about gas and electricity prices as a result of the big increases in world oil prices. The price of oil is starting to come down and I’m calling on energy companies to pass on the cuts to customers. But I wanted to make sure people are aware about the help and support that is available this winter. The Government has recently announced a new £1 billion package of measures to help families on low and modest incomes permanently cut their energy bills. - Help for families to make savings of up to £300 a year on their energy bills. - 50% off loft and cavity wall insulation for every household. - Free Insulation for pensioners. 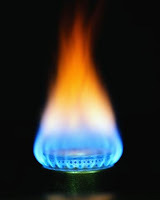 - Contact your energy company to check if you are entitled to be on their lower tariffs for those on low incomes. If you are on a low income or pensioner households on benefits you should contact Warm Front who offer up to £2,700 for central heating, insulation and other energy saving measures. You can contact the Energy Saving Trust for free, independent and local energy saving advice, including how to access deals on discounted or free insulation as you may be eligible to get cut-price deals which could help save hundreds of pounds on your fuel bills. This is a Government funded advice service. They can give you advice on resolving complaints you may have with your energy company and help with debt management. They can put you in touch with the right people at your energy supplier who can arrange reduced tariffs if you’re on a low income or other services such as free insulation. Home Heat can also check if you may be entitled to other help and refer you to Warm Front if you qualify. The Borough Council may also offer local help with local schemes to help reduce your household bills. - You can get a Winter Fuel Payments of £200 for households with someone aged 60 or over, or £300 if 80 or over. - Also this autumn you’ll get an additional one-off payment of £100 if you’re aged 80or over and £50 if you’re 60 or over, to be paid alongside your normal Winter Fuel Payment. - You may also automatically receive a Cold weather payment of £25 a week if the average temperature where you live is recorded as, or forecast to be, zero. degrees Celsius or below over seven consecutive days during the period from 1 November to 31 March. Act on CO2 0800 512 012 – ideas and advice on making your home more energy efficient. Consumer Council for Water 0845 039 2837 - takes up consumers’ complaints if they have tried and failed to resolve issues with their water and sewerage companies. The CWU and PCS trade unions have organised a joint rally in Crewe to protest at the proposed closures of the Sorting Office and the Tax Office. I will be supporting the event. 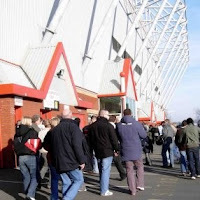 Supporters are asked to gather at 12.30pm, at the Crosville Club, Chester Street, Crewe, CW1 2LB. The march will start at 1pm and finish at the Municipal Buildings at 1.30pm, where there will be speakers. It was great fun. First time I've done a "free" abseil, ie not against a wall or cliff. The last one was down the side of Rail House in Crewe, this time I was in picturesque Millers Dale in the Peak District. 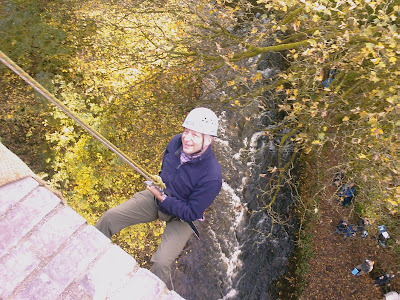 The abseil was organised to raise money for the cancer charity Marie Curie. It's not too late to sponsor me, to do so please click here. For more pictures of my exploits please click here. The speeches are over, the questions have been answered and the members choice is David Williams. David said, "It is a real honour for me to be selected as Labour's Prospective Parliamentary Candidate (PPC) for Crewe and Nantwich. I am delighted to have secured the endorsement of so many Labour Party members and activists from across the trade union movement. "As Labour's PPC I will now be concentrating on talking to the voters, listening to their worries and concerns and ensuring that their voice is heard in the corridors of power." This evening the Party members will make a decision, the votes will be cast and Labour's Parliamentary Candidate will be selected to fight Crewe and Nantwich at the next general election. I was down in the House of Commons today, organising a campaign day for Usdaw as part of our Freedom from Fear Campaign. The campaign seeks to prevent violence threats and abuse against shopworkers and make our shops and shopping areas safer for customers and staff. This year's campaign is focussed on the pre-Christmas rush in shops and asking customers that, although we know they are stressed, to stay cool and help the shopworkers help them with the shopping. At the Parliamentary event we asked MPs to match the behaviour to the customer and illustrated different customers with caricatures, which you can see in the background. The point is that it isn't just the hoodies that cause problems and shopworkers never know which customer is going to verbally abuse the. We also released figures from a new survey showing that the number of incidents of verbal abuse has reduced, but still over half of shopworkers say they have been abused in the last twelve months. We feel that our campaigning is making a difference to the culture, but there is still a long way to go. Pictured: David with Usdaw General Secretary John Hannett, Deputy General Secretary Paddy Lillis and shopworkers. Please click here for more information on Usdaw’s campaigning. Usdaw is asking MPs tomorrow to match the behaviour to the customer. 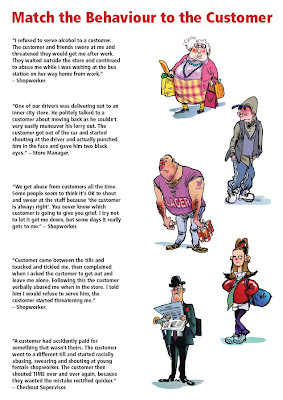 These are true stories gathered in our surveys of shopworkers as part of Usdaw's Freedom from Fear Campaign. Please click on the picture to have a go yourself. Gwyneth's former Parliamentary Assistant, Alex Phillips said, "I worked with David 15 years ago when he was the agent for Gwyneth. 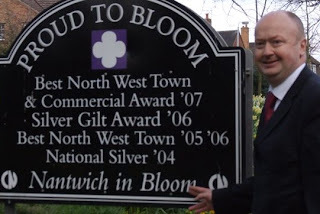 I knew then he would make a superb Member of Parliament, and I cannot think of a better representative for Crewe and Nantwich, as his connections to the area go back for many years." We were out in the top end of Underwood Lane tonight for Fight Back Friday. 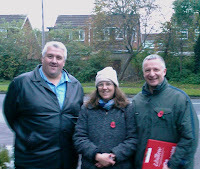 Cllr Mo Grant and Steve Pennell joined me for the door knocking session and we had a really good response. Only three people didn't want to sign the petition and everyone else was keen to ensure that Crewe Town has a strong voice through having its own council. I also found a lot of strong support for Labour. It was a very enjoyable evening and I hope the next time I am on the doorstep I will be Labour's Prospective Parliamentary Candidate for Crewe & Nantwich. South Cheshire member Jon Colclough says, "In the midst of a turbulent financial and political era, David is the man with experience and the proven track record of fighting for the rights of hard-working families who are suffering the most in the current climate. "What the local Labour Party needs is someone with the ability to connect with the local electorate and to work incredibly hard to win back the seat. But what the people of Crewe and Nantwich need is someone who understands their problems and challenges and is prepared to dedicate himself to their needs. "I think that on both counts, David is the best man for the job and I am delighted to support him." I've just received a photo of me at the CWU rally at Labour Party Conference. This is me with CWU General Secretary Billy Hayes. I marched under the banner of the Crewe Branch with members from the Weston Road Sorting Office. It was a tremendous event and they made a heck of a lot of noise. I know from friends inside the conference hall that the rally was heard. During the Conference I took the opportunity to voice my concerns and support for keeping Crewe Sorting Office open to Postal Services Minister Pat McFadden. I'm sure it didn't make a scrap of difference, but you've got to say your piece. It was very disappointing to read in today's Chronicle that it seems Royal Mail has already decided to close Crewe. I fully support the CWU at Weston Road and we must continue the fight. I will be at the rally on 25 October to give my support. 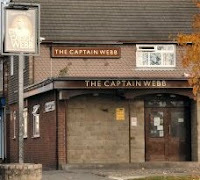 The next fight back Friday will be returning to the Captain Webb public house. We are meeting there at 6.30pm and will be visiting residents in and around Underwood Lane. As usual all welcome, including other shortlisted candidates, who might like to make a first appearance on the on the last fight back Friday before the big hustings meeting. Whatever the result I'm jumping off a bridge! No matter what happens at the hustings meeting on 17 October, win or lose, I will be jumping off a bridge! Fortunately attached to two ropes. I will be abseiling down the centre of an arch on the Miller's Dale bridge in the Peak District, which is over the River Wye. This is an 80 foot abseil of which 65 foot of that is free hanging. I understand that they do have a way of stopping me from getting wet at the bottom. I am doing it to raise money for Marie Curie Cancer Care. They provide high quality nursing totally free, to give terminally ill people the choice of dying at home supported by their families. Your local Marie Curie Hospice actively promotes quality of life for people with cancer and provides support for their families. The services are completely free to patients. World class scientists at the Marie Curie Research Institute are investigating how cancer develops to find better ways of treating the disease in the future. I am always keen to do fundraising for cancer charities after my father-in-law Peter Howarth died from cancer just over 4 years ago. So this abseil is in Peter's memory a great friend and old comrade. After narrowly missing out at the shortlisting meeting, Adrian Knapper, Chair of the Nantwich Branch gives his full backing to David. David said, "I am absolutely delighted to have secured the support of Adrian, who is an experienced and respected Labour Party activist. If selected I would be delighted to have Adrian working as part of the team to win back Crewe and Nantwich for Labour." I am absolutely delighted to have secured the overwhelming support of Crewe and Nantwich Labour Party's key activists today, having made a presentation on my suitability to be their candidate for the general election. The General Management Committee gave me the honour of a place on their shortlist and the opportunity to demonstrate to the whole membership of the local Labour Party that I am the right person to win back Crewe and Nantwich. We were out on the racecourse estate in Coppenhall tonight, having met at the Captain Webb public house. I was delighted to have Jon Colclough out for a second week on the run and to be joined by the local Cheshire East Councillor Terry Beard. Steve Pennell was, as ever, behind the camera. We were collecting signatures on the petition for the Town Council. I thought the support was much stronger because the recent letters in the Chronicle from Steve Pennell, Peter Nurse and Peter Kent. They have helped significantly raise the profile of the campaign. I spoke to Peggy Martin as well and she's filled another five sheets and is still determined to personally get 1,000 signatures. I took the opportunity to chat to voters about Labour and current issues, whilst they were signing the petition. I'm sensing definite signs of recovery for our popularity. People are gaining confidence in the Prime Minister to deal with the current economic woes imported from America. Usdaw General Secretary John Hannett said, "I am delighted to see that David is seeking to be selected as the Labour candidate for Crewe and Nantwich. He has the full support of all Usdaw’s affiliated branches. 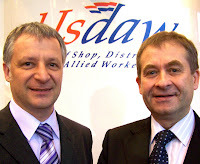 David is a hardworking, dedicated and talented Political Officer for Usdaw and I know he will be an excellent MP. "David has taken a leading role in organising our successful campaigns, including to protect Christmas Day, extend the minimum wage to 16 & 17 year olds, to extend family-friendly rights, and protecting shopworkers from violence, threats and abuse. He has progressed these issues through negotiation with Government Ministers, Parliamentary lobbying and mobilising activists to become politically engaged, I know that David will make a first class advocate for the people of Crewe and Nantwich. "David always puts our members first and understands that we are most successful when we are reflecting their real daily experiences and using evidence based arguments to gain new rights for hardworking people. "We would be very sorry to see David leave his role in Usdaw, but I know he will do a first rate job as an MP. Our loss would be Crewe and Nantwich's gain." The next Fight Back Friday will take place at 6.30pm, on Friday 3rd October, meeting outside the Captain Webb Public House, on the corner of Underwood Lane and McLaren Street in Coppenhall. The address is: Underwood Lane, Crewe, CW1 3SF. We will be collecting petition signatures for the campaign to get Crewe a Town Council and talking to voters about their issues and concerns. The longlist for the selection of a Labour candidate for Crewe and Nantwich has been settled. Nominations closed at noon yesterday. David said, "I am absolutely delighted with the result, because I managed to secure 85% of the nominations. This is way beyond my expectations. It is a clear endorsement from the activists in the Labour Party branches and the affiliated organsiations. "I am very much looking forward to the shortlisting meeting, where the delegates representing the various Labour Party and affiliated branches will decide who goes on the shortlist." After the door knocking session tonight we were walking back to the Cross Keys and met Cllr Peggy Martin on her way to work. Peggy is on a personal mission to get 1,000 signatures on the petition (I think she'll do it) which would be brilliant because that's a quarter of the target. She had a wad in her hand to take to the Club. On the way she stopped at the Cross Keys and collected some signatures from the locals outside, at the beginning of their Friday night out (see picture). They were a great crowd and we had a chat with them about recent car crime in the area. Peggy was making notes and I know she'll be taking up the issue at the first opportunity. 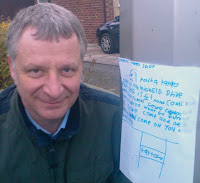 Just back from Fight Back Friday, which we did in North street Crewe. Again we were collecting signatures for the petition to get a Town Council for Crewe and talking to voters about supporting Labour. I have to say that the response to both is getting better. I think the recent letters in the Chronicle have helped the Town Council campaign and people are warming to the Prime Minister. I was delighted to welcome Jon Colclough to the usual team. Jon is a member in Shavington, who is currently studying at Oxford University. It's great to see a local comprehensive school student getting to one of the best Universities in the country. Jon is also famous for running the Crewe Rivals website. The next Fight Back Friday is at 6.30pm, 3 October, at a venue to be confirmed. David said, "As the agent and campaign organiser for Gwyneth Dunwoody MP I worked closely with Unison activists in Crewe and Nantwich to support Unison’s campaigns for better pay for health service staff, opposing cuts at Leighton Hospital and backing council workers in local government reorganisations. "In my current role as Usdaw’s Political Officer I have been working closely with the Unison representatives on the Labour Party’s National Policy Forum and I was part of the TULO team negotiating with Government Ministers on a joint trade union programme for the manifesto. We were keen to support Unison, on key issues like equalities legislation, free school meals and tackling issues around the two-tier workforce."